← Gloria in Excelsis Deo! Today, the fourth day of Christmas, is also the day we remember the Holy Innocents, the children slain by King Herod. The story of Christmas is a story of love, joy, and peace, but woven through it is also deep malice, murder, fear, and escape. In this sense it is a classic human story. It is a story that includes each of us, weaves us into its joy and pain. We experience Mary’s confusion when she learns she will be with child, without a husband in a culture that stoned women for this offense. We hear her faithful and mighty “be it unto me…”, her assent. We follow her to Elizabeth’s and know the joy of her holy child moving in her womb. Then we travel with Mary to Bethlehem for the tedious business of government taxation. We follow her, as she follows God. 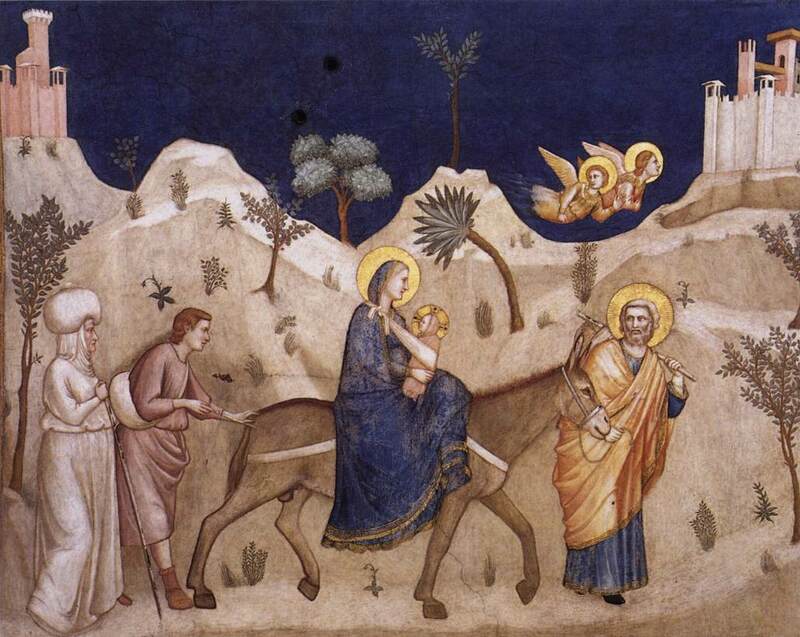 We hear the innkeeper send the holy family to a hillside cave, to give birth among the straw, among the animals, like an animal. The story of Christmas is our story, our human story of redemption, and each of us is woven into it through the miracle of time. A glorious king is born in a humble stable. Angels appear to shepherds and announce the birth in song. The shepherds listen and follow. Wise Men from the East follow a bright star to worship the Christ Child. They too, listen and follow. But this is not fiction or fable. This is history, the real world of the first century in the Roman Empire, where passions burn, where bad things happen. Herod plots to kill the newborn king, a perceived threat to his own throne, and slays children under two years of age in Bethlehem. As Jeremiah prophesied, “there was a voice heard, lamentation, and weeping, and great mourning, Rachel weeping for her children, and would not be comforted, because they are not.” And we weep too for these children. We weep for our own children lost each year. And so we remembered them today, on a clear crisp day in a parish church in Oakland, California. We remember this violent loss of innocent life, these holy innocents. Even in this great event, the birth of the Son of God, human will is not circumvented but allowed its freedom. Herod may act, just as others have acted throughout history. What God offers his precious children is a way out. He sends angels to guide us, to point to the right path. We have the choice to listen and follow, or to turn away. It is, of course, an angel who warns Joseph in a dream to flee to Egypt to escape Herod. And it is an angel who tells Joseph to return to Israel after the death of Herod. Joseph listens and he follows. “And he arose, and took the young child and his mother, and came into the land of Israel…and dwelt in a city called Nazareth.” (Matt. 2:21-23) And so another prophesy was fulfilled, that He would be called a Nazarene. The drama of the Christmas story has been cloaked with sweetness and light, an iconic beauty that is not unfitting. Yet the world of the Holy Family was not so unlike our own today, as we watch young martyrs die in Iraq, and allow holy innocents to die in the womb. Our story is the same story, one of choice, to listen and follow or to turn away. We can be part of God’s story or be part of chaos and death. We must choose, and these are the only choices. There is no middle way. And in order to hear the angel’s voice, we must be part of Christ’s Body, the Church. We must follow the commandments given, to love one another, to worship God on Sundays. Only within this world, this baptismal font of life, can we hear God’s voice. And through sermon, Scripture, and Sacrament, in time we come to understand what we are hearing. We approach the vision of God. We enter the vision. This story of God’s love is a story that is being proved by science, more and more each year. Eric Metaxas, author of Miracles: What They Are, Why They Happen, and How They Can Change Your Life, recently wrote in the Wall Street Journal that science is now making the case for the existence of God, an Intelligent Designer. Mr. Metaxas writes that “the odds against life in the universe are simply astonishing.” And that includes our own good Earth. The predictions of Carl Sagan in the sixties that life might exist on other planets have been discredited by scientific numbers. What happened? Where did we come from?How does life exist? Atheists are reconsidering. If we are wise men and women who seek the truth about our created world, we will look to Bethlehem. We will see ourselves there, caught in the drama of existence, the struggle between good and evil we know so well. We will listen to the angels and follow the star. For the story of the journey of Mary is the story of Christ in us, with us, as he was in and with her. It is the good news that the Intelligent Designer is this same God. This entry was posted in Uncategorized and tagged Angels, Bethlehem, Christmas, creation, Holy Innocents, Intelligent Design, Joseph, martyrs, Mary, Metaxas, miracles. Bookmark the permalink.